Robert Fripp's collaborations in the late 1980s and early 1990s with David Sylvian, in retrospect, clearly laid the groundwork for King Crimson's album Thrak. 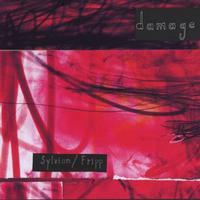 However, Damage, a live document from December 1993 featuring future Crimson members Trey Gunn and Pat Mastelotto, stands on its own, divorced from its slot in history, as one of the best releases from the principals involved. The set opens with one of The First Day's strongest songs, "God's Monkey". What distinguishes this from its studio counterpart is the immediacy of live performance. Everything is sharper. Fripp punctuates his icy runs with white-knuckled slashing fills while Mastelotto's restless, relentless patterns create a solid rhythmic background. Sylvian's cool delivery gains an added layer of urgency in the live setting while nevertheless dispatching his strong lyrics with customary laconic finesse. When someone makes it sound this easy, you know the work lodged to create that impression is as immense as their talents. Mastelotto's thunderous drumming opens this. It is a bit incongruous to hear Sylvian's smooth croon weaving through the harsh musical attack surrounding him. Intentionally or not, the contrast gives the performance more atmosphere. It sounds like Sylvian is singing in mid-descent as his best attempts to stop falling and preserve the redemptive in life is forever prey to darkness bearing down from within. The enemy, if there is one in a Sylvian song, is more often than not the songwriter's own voice. Fripp, Gunn, and Mastelotto generate a monstrous, violent backing, but their performance during the song's evocative final half is its dramatic, though understated, equal. This piece opens with a swell of keyboards, muted guitar, and a slow march from Mastelotto. The minimalist backing puts Sylvian's vocal and lyrics out front. As a writer, Sylvian is accomplished and subtle, often able to achieve through pointed implication what lesser writers mire in obscurity. The interplay between Fripp, Sylvian, and Gunn is quite strong here. Here is a silky number and one of the undoubted highlights from The First Day album and this live set. Sylvian's tongue-twisting vocal melody is ideal for this sophisticated, image-driven character study in miniature. Fripp excels here, as well, with staccato fills and an assortment of precise runs that act as the aural equivalent of action painting. His instincts for shading a musical piece are unerring. "Firepower,” another strong entry from The First Day, lives up to its title from the first note. Sylvian snaps off the end of each phrase while Fripp, Gunn, and Mastelotto unleash a bludgeoning riff that shellacs the listener into submission. Once again, the contrast between vocals and musical accompaniment is notable. Sylvian sounds like he's singing from inside a meat-grinder. This stands as one of the greatest achievements in both Sylvian and Fripp's long careers. This is steep, even shocking, praise to some, but rarely has Sylvian's writing struck such a perfect, but fragile, balance between the personal and universal. Certainly, Fripp's role as a guitarist has provided him with fewer opportunities for this sort of intense emotional connection, but rarely has his playing sounded as freed from cerebral concerns as it does when playing alongside David Sylvian. The result of this rare equilibrium is that aesthetic walls between artist and audience break down and we are able to feel another's experience free from notions of performance. Sylvian's stark, deeply emotive vocal hints that, while damage is an unavoidable part of each human life, the capacity for surviving it and finding transcendence is ever present - by mere virtue of singing about it. After opening with some jagged fills, "Gone to Earth" expands into a more folk music styled approach that will undoubtedly surprise some. The subtle tempo shifts engineered by Mastelotto give this song its tightness, but the other instrumentalists contribute significantly to the song. The melding of these disparate musical elements produces an unusual, but short, tune full of surprising twists and sounds. This revisits earlier territory trod in "Firepower,” but the repeating musical motif is not as belligerent as in the earlier song. Mastelotto's accents help add percussive variety to the piece, but Gunn and Fripp's foreboding, even eerie, contributions give the song much of its atmosphere. "Wave" opens with textured guitar from Fripp over Mastelotto's tasteful drumming. There is not any hook here, per se, for the listener to hang on, but the melodic sensibility working within the confines of this song is a much more complex animal than in its predecessors. There is a central melodic line running beneath everything, but Fripp and Gunn create an assortment of brief counterpoints to the central musical idea that deepen the song considerably. The slightly muffled snare sound that provides this with its pulse reminds me of a soft, but insistent tap on the shoulder. This is a song where Trey Gunn makes his presence felt more than ever before with a number of fills scattered throughout the verses that give the piece added weight. Here is an outright showcase for Fripp and Gunn to rock some and the light wah-wah pervading the piece is an unexpected touch. Sylvian's stylish vocal is another highlight, but the true pinnacle for the song arrives around the two-minute mark when Fripp exhilarates the listener with a brief, blistering guitar solo. 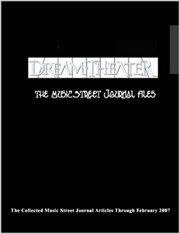 The final song is virtually a soundscape with a sketched out melody that rarely imposes itself on the listener. Instead, Sylvian's voice carries the tune again with the same warm confidence that elevates even his lesser songs. The quiet atmosphere of this piece is a perfect choice to end this collection and close the show.